A PDF unlocker (also called a PDF password remover, password reset, or password recovery tool, depending on its ability) is a program that can be used to either find, remove, or unlock the security on a PDF file that prevents you from opening, reading, printing, or editing the PDF file. Most PDF unlocker tools fall in to one or more of three major categories: tools that recover the PDF user password to free unlock PDF files, tools that recover the PDF owner password, and tools that remove the PDF owner password allowing full access to the PDF file and even add new encryption password. Here we introduce 4 of the best free PDF unlocker tools. PDFCrack is the best free PDF password recovery tool available, assuming that's what you're after - an actual password "recovery" and not a simple PDF unlock or reset. PDFCrack would be considered a true PDF password recovery program since it recovers both the user password and owner password from encrypted PDFs. 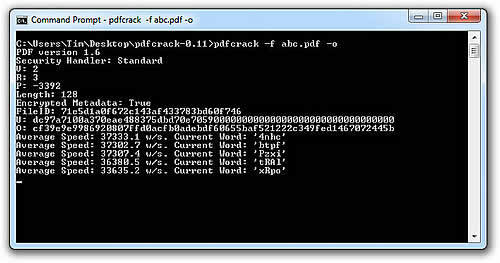 PDFCrack uses a brute-force password recovery method. PDFCrack works with PDF files up to version 1.6 with 128-bit RC4 encryption. PDFCrack is a command-line tool and should work on Windows 7, Windows Vista, and Windows XP, including both 32-bit and 64-bit versions. 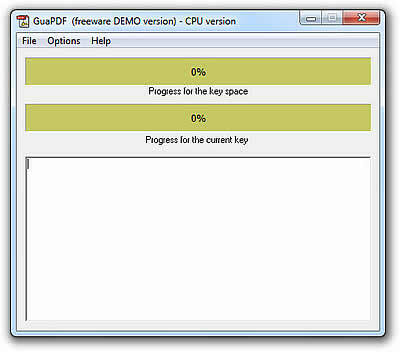 GuaPDF, sometimes referred to as Guaranteed PDF Decrypter, is a combination PDF password remover/recovery tool. GuaPDF is easy to use and doesn't even require installation. GuaPDF is primarily a PDF password remover tool for the owner password but can also be used as a PDF password recovery tool for 40-bit encrypted user passwords. GuaPDF works with PDF files up to version 1.7 level 3 even with 256-bit AES encryption. However, GuaPDF will only decrypt PDF files at higher levels of version 1.7 if the encryption is at 128-bit AES. GuaPDF works on 32-bit and 64-bit versions of Windows 7, Vista, XP, 2000, and most Windows server operating systems as well. PDF Unlocker is a Windows installable program that will find the owner password of a PDF file. PDF Unlocker works much like PDFCrack but is instead a native Windows application, making it a bit easier to use though noticeably slower. PDF Unlocker sounds like it might be a PDF password remover tool but in reality it's a PDF password recovery program since it discovers the actual owner password from an encrypted PDF. PDF Unlocker uses a brute-force password recovery method. PDF Unlocker works with PDF files up to version 1.7 level 8 with 128-bit AES encryption. PDF Unlocker should work in Windows 7, Windows Vista, and Windows XP, including both 32-bit and 64-bit versions. PDFMate Free PDF Merger is a perfect tool to unlock PDF files. It helps to decrypt any PDF for further usage such as merging multiple PDF files into a single file, splitting and extracting PDF pages, etc. It is a PDF unlocker but not just for this purpose, it is a multifunctional tool combining PDF Decrypter, PDF Merger, Image to PDF Converter, PDF Splitter, and a PDF Encrypter. You can use this tool to decrypt the original password and then add your own encryptions for the output files, such as password for opening, reading, editing, and even printing. PDFMate Free PDF Merger work in Windows 7, Windows Vista, and Windows XP, including both 32-bit and 64-bit versions.